a retro recipe, 1960's style. There's not a man (or woman) alive who could resist your charms after eating this! Cream cheese, tinned fruit cocktail, gelatine, mayonnaise, marshmallows - as far as retro recipes go, this one's got it all! If preparing this (I felt the urge to vomit long after these photos were taken!) is not a sign of the lengths you're prepared to go to for love, then I don't know what is! Let me know if you get lucky. p.s. this doesn't taste as bad as you'd think it would. Honestly. Awesome Kylie, so awesome... someone's going to be a very lucky valentine tomorrow!!. Mum gave me a couple of round versions of those milk glass plates with sweet heart edges, I should try and dig them out!. Oh and lace baubles have been found and pinned - can't believe I missed them in December, so cool :). Ps thanks for the lovely note, I appreciate it. Oh my. the addition of moyonnaise. or salad dressing (even worse). Do love the splades! I grew up with them and now have drawerful, the ultimate family cutlery item. My kids will automatically put spades on the table unless I say "knives and forks tonight". Also love those lovely 50's bowls.... mmm Sorry, there was food also? OMG Can't believe you made this monstrosity of a recipe Kylie. Looks like a Fanny Cradock original. What a great Valentine's post! It is so beautifully styled Kylie, I could look at it over and over again. Eating it however, might be a different matter! :D Jelly, cream cheese and mayonnaise?! Did your little troupe polish the lot off? hi kylie...that 2nd pic is very disturbing!..as a nurse I can tell you it resembles a lot of things....none of them good sorry. We`d be sending it for a biopsy quick smart. But....the sentiment behind it is lovely. And of course the styling is fab! That's hilarious looks a bit like a brain on a bed of lettuce - (now there's another idea for a valentine special). We get two chances here in Wales as we have St Dwynwen's day on 25th Jan - went tasteful for that, so maybe I should go for the pink jelly brain next. Every time I see one these retro recipes I wonder how the hell we survived the 60's and 70's without copious vomiting. Your whole table layout is too hilarious! And nothing says 'Amore' more than sliced iceberg lettuce. I love you! Be my Valentine! You are too, too funny. PS Kiss the girls for me. And Anth. I'm sorry I couldn't bring myself to read the recipe yet because I am still feeling a bit vommy from the photos. I was just thinking about you and your hilarious retro cook offs this week! I'm still laughing!! Happy "VD Day" as my Hubby calls it -cheeky bugger that he is! I grew up eating concoctions like this at holiday meals. 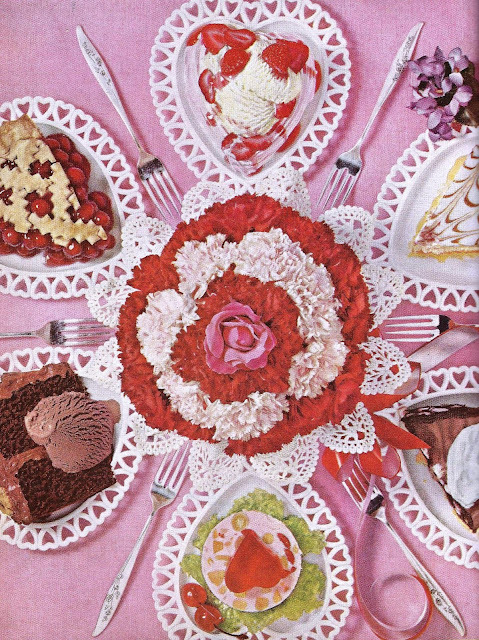 My grandmother (the one who wasn't a good cook) loved to make "Jello salads." My favorite part about yours is the wonky heart. :) Thanks for another great recipe! I just have got to say I love your plate. It is so pretty and perfect for serving up a pink and red fluffy and jelly sort of sweet n tasty treat. That said - it's bit vile, isn't it? But it a totally retrotastic way! As always, you are Queen of the Retro Kitschen, my friend, and I'm sure Anth agrees. Oh my word! So much pink, jelly and of course love. The first shot is hilarious - the lovely rose atop of the jelly fare on the iceberg lettuce!! Food matches made in heaven. How did I miss? You broke out the vintage recipe box again. Naughty girl. you really are one in a million kylie, in so many ways! Good lord, you have a brave man and a true love there if he ate that! (not that it doesn't look fabulous, in a crazed Barbie-esque kind way). I'm having a hard time figuring out whether this is supposed to be sweet or savoury? I think a new career in food photography awaits though. Poor fellow that hubby of yours, loved the tablecloth and the dishes oh, and the gelatin hearts. Am LOVING the table setting. Those roses are one of my fav pattern. However that dish is...ummm...I am lost for words...Spammy??! It looks like vomit put into a mold. Lol. oh my goodness, i'm just not sure i'm liking that haha table looks good though! !